This is an ongoing project that I write about from time to time. It started when I read ‘A Hundred Pieces of Me’ by Lucy Dillon. When Gina and her husband split up she moved to a lovely new flat, and she vowed to clear out all of the ‘things’ that she had acquired over the years and live a simpler life. I thought that I should do that. Because I’m living with my own things and a lot of my mother’s things, that she has left behind but I can’t quite let go. I have to find a way of separating what was my parents’ history that I have to let go and what was my own family history that I have to hold. And when a friend gave Gina the idea of photographing her memories, well that have me the idea of photographing and writing a little about the things I have to let go. So I can hold on to the memories and let go of the clutter. Author Jane Johnson brought the idea to the front of my mind when I heard her speak at the Penzance Literary Festival last month. She suggested that there were two kinds of people: the kind who want to seek out the exotic and the kind who want to gather the familiar around them. she’s the former and I’m the latter. but a thought came into my head. Those of us who gather the familiar also need the space to gaze at the stars and dream. The advertisements were alluring, but I always thought that it sounded a little too good to be true. And I learned that it was. The editions were cheaply produced facsimiles, and if you weren’t quick off the mark saying ‘no!’ to the book of the month it was assumed that you had said ‘yes!’ and it would land on your doorstep. One day the book clubs found a new strategy. They picked up their telephones. When my mother received calls from warm, chatty booksellers asking if she would like a free book she was always delighted. She didn’t take in the swiftly delivered spiel, saying that she would receive another book that she would have to pay for, and that the rest of the series would follow. I became very efficient at sending those second books back and making sure that no more books would follow. But one day I slipped up and we were committed to a series. It was maddening, but at least it was Agatha Christie, who my mother and I both read and might re-read. The books arrived, month by month, until we had the complete set. I say ‘complete set’ but it wasn’t really. We had a full set of Miss Marples, a small selection of Poirots, and several volumes of short stories in nice facsimile editions. I thought that I might lose a few and acquire one or two of the key titles that we were missing. But when I bought home another title – ‘Evil Under the Sun’ I saw that it was a little bigger than our books and printed on better quality paper. I dropped the idea of building a collection and the books sat in limbo for quite some time. Eventually, I decided that they could go. There will always be Agatha Christie books in the library if I want to read them again; and I don’t want to re-read them just because they’re there, rather than reading more of the many books I have yet to read. Most of all though, I don’t those particular books sitting in the house as a reminder of my mother’s increasing mental frailty. They also remind me that we had to change the telephone number we’d had since we first had a phone. Because my mother would receive calls while I was at work, telling her she was due a refund, that they had to confirm all of her personal details, that they needed her bank details …..
She took people at face value, she believed that people were fundamentally good, and it was so difficult not to disabuse her of that faith, not to make her fearful, as I tried to make sure she was safe and well and happy. This particular memory has to be caught and put away; it won’t be forgotten but I won’t have to remember it every time I look at a particular shelf of books. The local charity shops are always appealing for books. I have a shelf, and I have to think about what to put on it ….. I remember seeing the adverts for book clubs but I’ve never been tempted as I’ve always been wary of things like that. 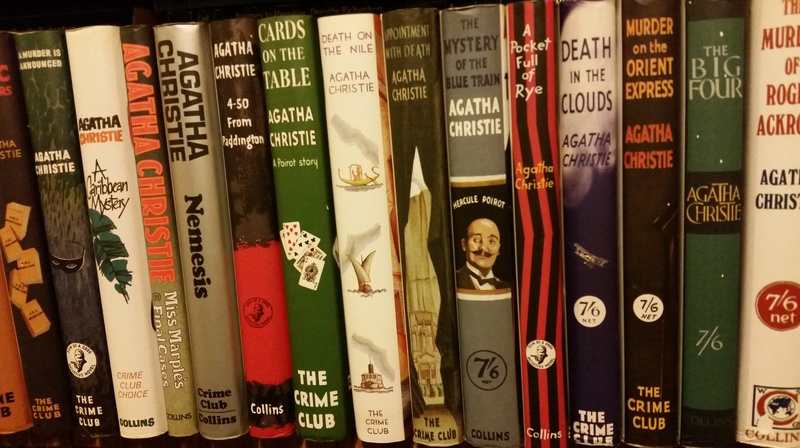 I can understand why you don’t want those books on your shelves bringing back bad memories – and as you say, Agatha Christie’s books are easy enough to find if you do feel like reading one. I used to go through the advertisements and work out which book I’d pick, but luckily I didn’t sign up. I’m pleased that I have the books bagged up ready to go to a charity shop and to have a shelf clear. Ah yes. Your piece has truly struck a chord of recognition for me. I remember finding box after box of book club selections after my mother passed, all sets of mysteries or other paperbacks of the type she enjoyed for relaxation. She was a writer and counselor by profession, so having a supply of new and stimulating reading just seemed second nature (as it does to me!). But, the bittersweet part was that so many boxes were stacked, unopened–the tide of new books just overwhelmed her at some point–even the “free” ones–and she didn’t know how to stop it, and wasn’t ready to accept my help to stop it. I found places for many (but not all) of these books with friends or donated to the library. At some point, I began to believe that the adage “you can’t take it with you” applies not only to our most cherished possessions but also to those bits of our material trail left unfinished, unread, unmanaged. In the end, we all part with our loose ends and frailty, as well, in a new mode of freedom. I think that the love of books can outlast our ability to read them. It’s several years since my mother had the concentration and the short tem memory you need to read a novel, but she’s still interested in what I’m reading and hearing more about books and authors. I agree that we need to keep only our most cherished possessions, because too much clutter does detract from their wonder. But the theory is easier than the practice. I have always felt that these offers, were slightly too good to be true. I remember friends of my own age, being convinced when they moved from offering books to CDs. I think I’m too cynical. I can so understand why you would want to send them on to another place. I had trouble with my grandmother just the same, who was changing her energy supplier virtually monthly because of their spiel. It’s these memories that I try not to remember. They were too good to be true, and we’re not being cynical when we’re aware that the people ‘giving away’ books have to make their money from the recipients. I remember energy supplier ringing too, but I think we both need to learn from those memories, pack them away and then move forward. I found this post moving Jane. Your love for your mother shines through so strongly. My mum is 87 and as you say they need our love and care at this age as they are vulnerable to cynical salespeople. Definitely the right decision to find another home for these books. Cynical sales people are a nightmare when you have to protect someone who accepts things at face value and was brought up to be polite. We daughter have quite a job to do! You’ve reminded me that my dad was in a record club, but luckily that was rental and everything went back in the end. I was tempted to hang on to one or two of the books but I knew it would be the start of a slippery slope so I didn’t. I echo what Jane says, Fleur/Jane, such a tender and loving post. Memories of those we love are always so bitter and sweet all together. The sadness of loss because of the sweetness of the love and connection. They are, and I have inherited so many family possessions that I had to so something, and photographing, writing and then saying goodbye seems to be a good answer. It’s a lovely way to be, and if only more people were the same way …. That’s a beautiful post. It’s hard to get rid of books when they hold memories, good and bad, I think. I inherited a full set of Zane Grey cowboy novels from my Grandpa when he died – the only thing I inherited from him. But there were A. Lot. of them, and there wasn’t room on my shelves. I Freecycled them in the end and gave them to a young chap who seemed absolutely thrilled with them – they were a uniform edition and he was looking forward to displaying them. It felt good to do that. I was in QPD for a few years – got a few good things from them but the books were that annoying extra-large size. And I gave them hell for sending me a book I’d said no to and managed to get it so they never sent me the book of the month, ever, unless I specifically requested it!